"Some litigants have contended, for example, that the banks dumped loans they knew to be troubled into securities and then misled investors about the quality of those underlying mortgages when selling the investments." In addition to the leaked investigation, Morgenson makes a critical point about ongoing federal and state attorneys general efforts for settlement order on mortgage fraud, fictional mortgage agreement s, and matters related to ForeclosureGate. The settlements (consent orders that avoid a trial) by the Obama Department of Justice and the state attorneys general would cost the big banks and Wall Street a few billion dollars in legal fees but free them from civil suits that could stretch into the trillions and jail time for criminal fraud. The New York AG's actions stop any settlement in its tracks since, according to Tiabbi; it takes all 50 states to generate a consent order. Should it become official, Schneiderman's investigation would also set a high bar for any other settlements. It could also simulate demands for serious prosecutions around the country. Serious charges by Schneiderman would also make a federal settlement like the one leaked to American Banker look simply awful to the public. 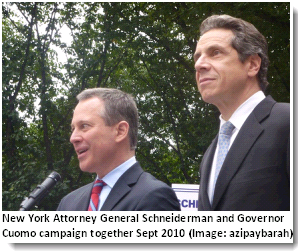 Nexus between Cuomo 2009 Charges against Bank of America, Schneiderman's Investigation, and the Senate Report on "Wall Street and the Financial Crisis"
On February 4, 2009, then New York Attorney General Andrew Cuomo filed a complaint against the Bank of America, Kenneth D. Lewis, and Joseph L. Price. View All 34 Articles in "The Money Party"